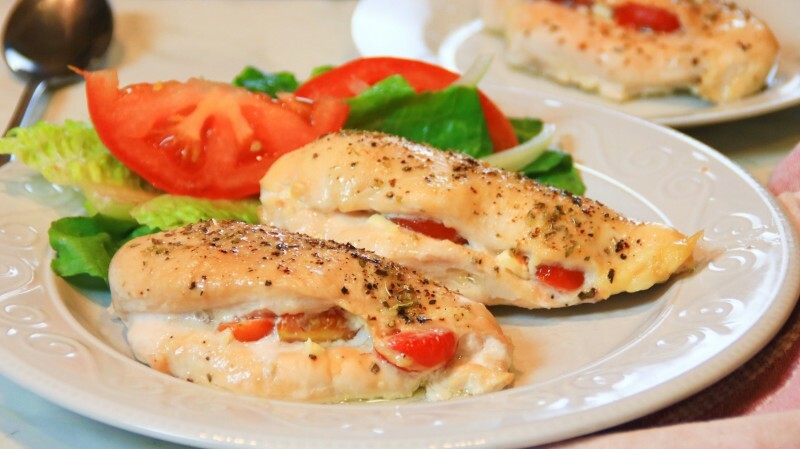 Feta and tomato stuffed chicken is a delicious combination of flavors. When I serve this up, my family and friends go crazy for it and beg for the recipe. It is so simple to make, as well. You cannot go wrong with the recipe. You do not have to use feta, as you can use the cheese of your choice. In my opinion, however, feta and tomatoes are the ultimate match. You can vary the spices, as well. Just keep in mind that some spices are friends of different proteins. Give the dish a try and let us know what you think. Always drop us a line. Preheat your oven to 350 degrees F or 180 C.
Add the cheese and tomatoes into the the chicken breasts, fold them over, and insert a couple of toothpicks to ensure the remain in place. Spread some olive oil on the bottom of a baking dish and place the chicken in. Season the chicken with salt, ground black pepper, oregano, and garlic powder. Drizzle a bit more olive oil over the top and bake for 30 to 35 minutes. Plate, serve, and enjoy your feta stuffed chicken.